Does thoughtfully organic, water-conscious agriculture happen in the desert? Can it work? Based on what my friends and I witnessed at Flying Disc Ranch this Saturday, the answer is yesity, yesity, yes. Curious to learn more about what I had read online describing the ranch, I emailed the owner, Robert Lower, and asked if I could visit. He welcomed me kindly, and when Elizabeth and Sarah and I rolled in Saturday, his son Eric and his WWOOFer Lalo Porto greeted us warmly. The immediately noticeable aspect of the ranch is the difference from the agriculture that surrounds it. This, across the street from Flying Disc, is an industrial agriculture potato field. My friends and I had been a little turned around when we were trying to get to the ranch (this is becoming a trend, apparently), and we found ourselves on a dirt road bouncing through another date farm. In that farm, the rows were perfectly straight, the trees uniform in size, and the soil free of any life. This farm had its own elegance, in an austere, clean way, but it was a far cry from the raucous liveliness of Flying Disc. 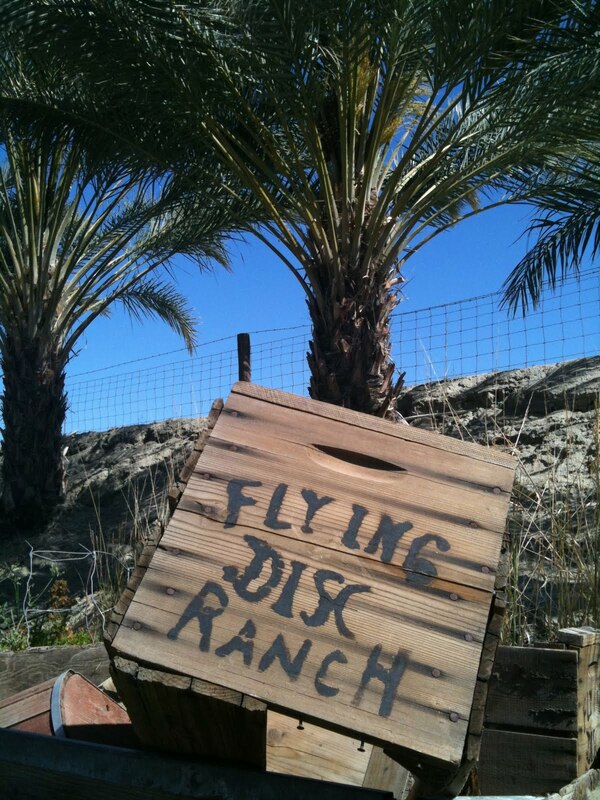 Unlike the carefully manicured and uniform date farms around it, Flying Disc shines due to its lack of uniformity. There is not just one kind of date; there are many, including a few quirky seedlings. In fact, there aren't just dates, but the farm echoes the structure of a jungle, with layers of life. The top story is crown of blue-gray fronds and beaded sprays of waxy date flowers. Citrus trees—temple oranges and grapefruit—form the middle story, and the bottom floor is a carpet of compost and grasses. Other plants live here too, some that don't give a crop, but provide homes. Underneath this old, untended date palm decays a truck, and behind the bench seat of this truck, bees have a built a buzzing hive. Two owls live in the shaggy skirts of this fan palm. Near the house, in an area free of palms, the Lowers have a few rows of grape vines and a vegetable garden. Eric listed the grape varieties, six or so, and the one that sticks most in my mind is the Red Muscat. Constantly on the hunt for good muscat grapes, I asked if they sold the grapes at market, as they do the dates and citrus. "We do, a few. We try to eat as many of them as we can because they're so good, and sometimes we only sell one box. Usually one person will buy the whole box." What makes this farm work is the balance of control and nature. The farm uses a careful drip system, avoiding water waste, and drawing from its own well. Instead of killing weeds and grass under the trees, the farm leaves them to cool the earth, allowing the dates to ripen more slowly. 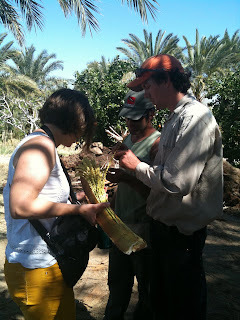 Eric told me that they consistently harvest dates a month later than the farms that surround them. No synthetic fertilizers stain this soil. Yet, the soil is rich and retains water; the Lowers achieve this by composting fronds and farm waste, then mulching the trees with the aged compost, entropy with a watchful eye. The compost does more than fertilize and retain water, as the Lowers deeply mulch, mounding well above the soil line, trees that they want to reproduce. The pile of mulch gives a place for trees to begin to root from their bases, and they sprout healthy offshoot clones. They then plant the offshoots where they want them for the long run. They've found that potting the offshoots up to mature, then planting them again into the earth slows the growth of the young tree. Planting the offshoots directly where they will spend their lives allows them to develop a strong root system early, therefore allowing the trees to fruit while younger. And date palms don't reach maturity early as it is; it takes ten years or so for a tree to begin to fruit. Seeing date palms bloom is like stepping back in time a millennium or two. As Lalo pointed out, "The flowers are Jurassic." And they are. They're white, waxy brooms of either male or female blossoms that split sturdy canoe-shaped pods open as they burst into fecundity. He and Lalo explained how date reproduction worked as he handed me the spray. My friend joked that I looked like I was holding a baby. "She is, hundreds of 'em," Eric said. To ensure the best pollination, the ranchers hand-pollinate. They climb the trees and harvest the male blossoms, whiter and more fragile looking than the female flowers, just as they begin to bloom. From these blossoms, they collect pollen, then climb back up the trees to pollinate. Lalo keeps his pollen in his work apron and tosses pollen on the flowers; Eric uses a squeeze bottle. After spending over an hour wandering through the farm and learning, we had the opportunity to taste the ranch's product. Near the house, behind a heavy insulated door hides stacks and stacks of boxes of dates. It was chilly and dark in the cooler, and I can imagine after working through a good portion of an August day, this is where everyone must hide out to cool down and keep from turning into dates themselves. Eric rustled through boxes so we could taste what varieties they had to offer. His favorite is the Deglet Noor. Lalo says he likes them all, and proved it with a pile of date pits. We left with a large box full of three varieties (and some citrus, for good measure). We purchased Deglet Noors, slightly crunchy, less sweet, nutty, Medjhool, huge and molasses-y, and Barhi, melty and caramelly, my favorite. All are delicious. Eric and Lalo were generous with their time and information. I tried to thank them as we left for their openness, but probably failed in saying how much gratitude I felt. This morning, into my cereal, I sliced a few Deglet Noors. The tree that gave this fruit lived a decade before fruiting; it was watered without waste; it may have even been an offspring of an older tree on the ranch. The fruit that I sliced had been monitored by hand its entire life; it was pollinated by someone who had to climb up a ladder and into the branches; it was harvested with the same care and bodily risk. Thank you, Eric and Lalo. This is so amazing! And, being from Boston, I've never seem anything like this. Thanks for the tour. Wonderful tour, Christina. so glad you took us along. Molly: You're welcome. Though I had seen date palms before, I had never seen how farmers produces the fruit, so this was all new and fascinating to me, too. AH: My pleasure. It was a fantastic day. Yeah, it's fascinating when you find people who grow (with such care!) according to a) what suits the climate and b) realise that you have to work at the soil in order to make it, ya know, fertile. That date flower is completely enchanting. Lucy: You would've been over the moon there.